Last night I sat down to sew the scrap pieces together to complete the 4-patch blocks called for in the En Provence mystery clue #1. I finally took a break and this mini munny figure was sitting out so I drew on him. My daughter gave it to me last year for my birthday just for something fun to do. I drew him how I felt at the time and hubby started laughing when he looked at the face. This morning I finally finished the blocks and pressed them. I did a final count and I made twenty extra blocks by mistake. I shall cut those down to 1 1/2" pieces and sew them together to make something small. 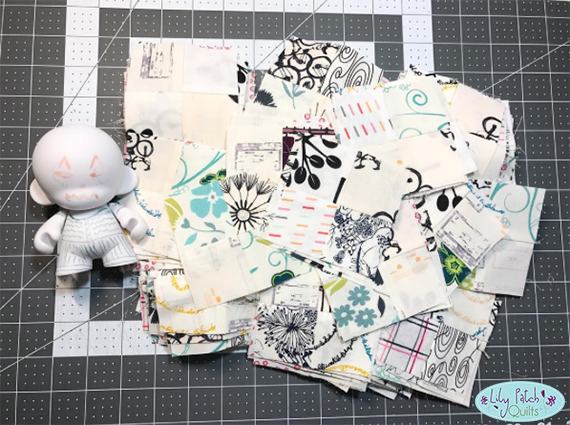 I am going to use up these scraps as I get them for small quick projects from here on out so I don't have a bunch laying around taking up space. On to clue #2. YIPPEE! UPDATE: As I was driving a thought popped into my head regarding these 4-patch blocks. I could have just cut out assorted neutral prints to the size the blocks were called for and don't have to sew a thing. It would be super scrappy but it would have saved a ton of sewing and pressing. Maybe next time. I've never seen a Munny. What a fun idea. Although, yours doesn't look like he was having very much fun. Your scraps are making some cute blocks. Good luck with the next clue.